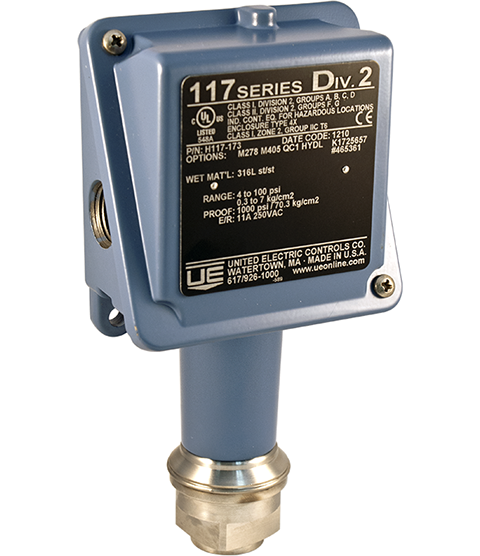 Approved for Division 2, Zone 2 hazardous and corrosive atmospheres, and with optional Zone 0 intrinsic safety compliance, the 117 Series can be used to measure vacuum, pressure, differential pressure, or temperature in a variety of applications. 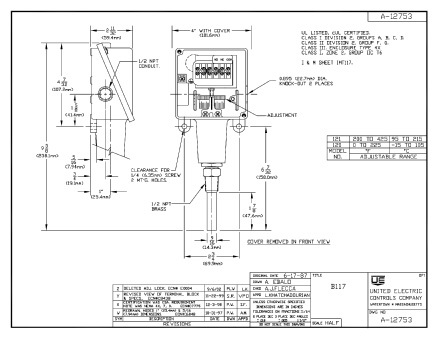 The rugged, one piece enclosure features a slanted cover for wiring accessibility to the enclosed terminal block that is wired to either a SPDT or DPDT hermetically sealed microswitch. 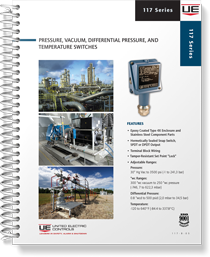 All welded, stainless steel pressure connections and sensors provide superior corrosion resistance – NACE compliant – and fire-safe protection within the harshest environments. The 117 Series is an ideal choice for the most demanding applications; typically steel and aluminum mills, chemical and petrochemical plants, pulp and paper mills, wastewater treatment plants, midstream and downstream oil & gas, and pharmaceutical plants.